What happened in this book? I can't tell. It had no plot, no character development and to add insult to injury, the prose is dull. I had to whip myself into finishing and only because I hate purchasing and then letting the book languish. After all, if I finish at least I have the pleasure of mocking it. Ummm, Stephen has spots and inherits some property and there's some mystery surrounding it and weird animals (and you never quite figure out what they are) and in the end he has to stay on the property forever and ever or he loses the house. Except his lawyer's daughter shows up at the end and she's all cute or something and by then his spots have disappeared and he has long hair that's shiny blonde. I mean, seriously, WHAT THE *&^$^&&?? He has to stay in a house FOREVER or risk losing it. I mean, at that point I would have been like "See ya, Creepy Crypt Uncle, you can take your mansion and shove it!" And the part at the end where he sees the girl and it seems like he's going to drag her on to his gated estate and they'll live there forever and ever and never ever leave, not even for toilet paper is creepy as all hell. If I am ever forced into a horrid winter situation where I have to burn my library to survive, this goes on top of the pile. A really wonderful children's novel that should one day be a classic. After finishing this book that was not tears, I just had something in my eye... in both of them. Save The Rain Forest. I was initially drawn to the book because of the gorgeous cover. I also looked inside and liked the old-fashioned pen-and-ink illustrations. Seeing there was no reviews, I relied on the inside blurb claiming the book "returns readers to the art of true storytelling. "Unfortunately, halfway through the story, I still hadn't discovered what that art of storytelling was. I realized I had gone through half the book already and there was still no form or plot. It was mostly descriptions and repetitive actions of the protagonist. The story did try to pick up steam a bit, but it was already towards the end of the book and felt contrived. Was the writer hoping this would be the "next" Harry Potter with the open-ending?For me, a good indication of a great story is when the writer is able to convince me that I'm actually an inhabitant of the fictional world they have created with words, that I'm actually there with the characters. This story wasn't that convincing, although very descriptive, it became tedious and boring eventually. I really felt like I was reading something required for school and not for leisure.If people want to read a great story from a master storyteller, I highly suggest The Eyes of the Dragon by Stephen King. He is lesser known for fantasy, but this is my favorite work of his. There is a beginning, a middle, and an end, and the plot moves along quickly that there is not a dull moment. It is a hero's journey, and all other characters are thought out carefully as well. I believe the entire novel wasn't even as long as this one. So whenever I come across someone claiming to be a "storyteller", King's book is the one I gauge it against -- and that is a high bar.I did want to like this book, especially agreeing with the topic on environmental awareness and conservation, but I just can't. Like other reviewers noted, it was too preachy. Dr Seuss' The Lorax is about the environment, too, but brings the message more vividly -- and in rhyme, too!It also felt this book needed a heavier hand in editing. Part One was just descriptions. Part Two seemed rushed. It could have been better.I only managed to finished it quickly because I wanted it to be over and done with....Also, it left me wondering if the author was truly championing saving the Amazonian rainforests. If that was true, wouldn't it be more effective have her characters stay in the forest, rather than illegally smuggling flora, fauna and a native to another part of the world? I'm just not entirely convinced. Okay, don't listen to the bad reviews. To get to the climax of the story, you're going to have to read for a while, and don't give up. Around the last quarter of the book is when the secrets come out, and the mystery and awe appears. As the main character starts to read the journal of his uncle(?) (It's been a while since I read it) be starts discovering secrets about the old house, and what really happened in the jungle. I think this was a truly captivating read, and you will think so too, if you let yourself get into it. I wasn’t sure about this one because the blurb on the back didn’t say much about the story other than that it involved an orphaned boy who suddenly finds out that he’s the only beneficiary in a never-before-seen great-uncle’s will. But it takes place in Cornwall, which is, as any folklore lover knows, one of the most mysterious places on earth. We first meet Stephen Lansbury as he’s just finished a course in botany and is fretting over whether to return to the children’s home where he grew up or set off on his own. An elegant letter from Postlethwaite and Postlethwaite arrives, which brings Stephen to an odd interview with an ancient lawyer nestled comfortably in an office overrun by a jungle of plants. Bertie Postlethwaite informs Stephen that his great-uncle Theodore Lansbury has left him an estate in Cornwall, and Stephen should be getting on there right away to “take care of things.”With a train ticket and 100 pounds from Mr. Postlethwaite in his pocket, Stephen heads to the wilds of Cornwall. There he finds gates that mysteriously open, overgrown grounds, and an empty but spotless manor house. As he explores, Stephen begins to notice things. Like the strange “woomp, woomp” calls in the forest, the fact that the house has no electricity, that some of the rooms have thick layers of dust all over everything while others are spotless, the odd hammocks hung in the library and in a room upstairs, and the creepy feeling that he’s being watched. Eventually, Stephen finds his great-uncle’s journals and becomes privy to a grand adventure had by his uncle and his friend B. As the days and weeks pass, Stephen comes to realize that his uncle brought part of his adventure home with him, a revelation that solidifies when Stephen finds an injured animal of a type he’s never seen before. He nurses the animal back to health, and is eventually led by the animal to find the greatest secret of all.I confess that I am a sucker for stories that involve mysterious houses, unexpected inheritances and great secrets, so this book captivated me immediately. As I read, I felt like I was gently being led down a path and at the end I would find a fabulous gift. And that’s just what I found at the end of this story. The events unfolded at exactly the right pace, and the characters were all wonderfully drawn. The only thing I didn’t appreciate was the author’s occasional tendency to preach about the destruction of the rainforest. Although the topic was certainly pertinent to the story, the facts were presented awkwardly and didn’t really fit into the narration. All in all, though, this was a lovely, gentle story…give it a try. I am so very torn about this one. Hussey's language is very vivid and illustrative, bringing the reader right into the scenes she sets. It's impossible for you to not come away fully understanding the landscapes, or the structure of Lansbury Hall. You know just what the kitchen looks like, know just what the bedrooms look like, and can almost breath in their musty mysterious air. But, here's what I've had to conclude: the wonderful descriptions do not make up for the fact that you go nearly 250 pages without anything truly exciting happening.I mean, of course things happen, but nothing gripping. Very patient readers who want a relaxing mystery will enjoy this. Anyone else will grow frustrated before the "mystery" is revealed. The botanical descriptions are interesting, and there is an underlying call for advocacy and action to protect the rainforests. But, again, that doesn't make up for the fact that your protagonist largely interacts with about three people in very brief episodes, and is largely plodding about the Cornish countryside talking to himself and reading journals for the entire book. He eats, he explores, he copes without electricity, and he reads. Stephen doesn't say anything interesting past little interjections when alone. He cares for wounded animals, meets a very important human at the end... Again, I emphasize, at the end. Everything noteworthy happens during the last 100 pages. There's also the matter of how she puts things in quotations when Stephen refers to something using words that don't actually describe what they are, like the "hanging bat" of the hammock or the "odd collection" of fire-starting things on the table. I was extremely irked every time this happened. The "dancing eyes" he saw through the window, too. Like there's this little ironic voice in my head every time this happens, and I have to act like I'm partaking in some little joke.When I look at who Hussey is, though, I understand why she writes the way she does-- most likely drawing upon her archaeological experiences and relating a tale from a very academic standpoint where these small details make up a larger fascinating picture. But, oh, that doesn't make it exciting. If this is indeed for children or even young adults, I just don't know how you could get them reading until the end. Looking at reviews on here, many seem to be adults (I'm in my twenties), but where are the younger readers? What do they think?So, I think this novel is beautiful in its own way… but was very tedious to get through. I lost patience around page 200 and began speed-reading past that. Oh I so much loved the beginning of this gorgeously described novel. It had a fairytale, innocent and light quality that skipped along. But, that quality actually started to become very grating by around page 130 - there was just no confrontation, no real "darkness" and, importantly, the main character spent so much time on his own in the house he had no one to play off of and it became dull. Worse than that, it started turning into a sappy version of a Famous Five novel, but without much adventure.Aaargh, Charmian can REALLY WRITE very well and I'm actually not happy with giving this one a bit of a pasting here as it could have been so much better. And I actually think this opeinion is very subjective because there just wasn't enough dark intrigue for me, which is ironic as it's called The Valley of Secrets. It was just too much of a lame version of the VERY good Spiderwick Chronicles.If you're into sweetness and light stuff you'll probably like this. I, however, gave up on page 150. Sorry Charmian...as I said, some beautiful language just not enough impetus in the story. The Valley of Secrets by Charmian Hussey tells the story of an orphaned boy, Stephen, who inherits an estate from a distant and unknown uncle. When he arrives he finds a mystery about the estate and its grounds as well as one about his uncle. Stephen teases out his answers by exploring the grounds and by reading his uncle's diary about his explorations in the rainforest. I enjoyed the somewhat classical form of writing: descriptions that set the scene, and the premise of a protagonist who longs for--and discovers--family. A pleasant surprise was that the book included an environmental flavor. Despite the fact that portions were the text of a diary, I didn't find reading a book about a boy who was reading a book to be tedious. In particular, I liked the gradual revelation of creatures and plants that helped advance Stephen's understanding about his uncle and the mystery of Lansbury Hall. Listened to this on audio and nearly dozed off...multiple times. Very little action, hardly any dialogue, lovely and LENGTHY descriptions... might have been nice to find in grandma's attic on a rainy afternoon and read snuggled up by the fire, but I couldn't get into it. Although I had to finish it to see what happened...and it was as I expected. This book was so boring I almost didn't finish it. But, sadly, I did and made some of my brain cells die in the process. I was initially attracted to the gorgeous illustrations in this book, but unfortunately the book itself wasn’t very enjoyable. I had high hopes for this as it seemed quite unusual and the potential to be interesting but it was disappointing. Generally I quite like descriptive writing and I'm not too bothered if a book hasn't got much action but this was too description-heavy and tedious for me. Every little thing he does and thought process he has is described and most of these descriptions do not move on the story!Not much seems to happen for large chunks of the book and most of it is just him walking in the countryside and some diary entries about a jungle. I do feel the story could have been told much more effectively in half the number of pages, it was not worth the 430 it took up.The odd bit of plot and characters (all extremely minor as they make up only a tiny part of the book) there were among this didn't really seem to hang together particularly well and it felt a bit random. The main character was neither particularly interesting or likeable. This book was overwritten and I have ever read a book which manages to have so little happen over so many pages as much as this one does. It’s a pity, if only it had been cut down then it might have been okay (but not amazing). Luckily it was brought cheap at a charity shop where someone else had also obviously found it uninspiring! This was among the dullest things I've ever read. The protagonist had no personality. There was no conflict in the book until the last ten chapters and then it was just money troubles for keeping the mansion and it was solved in one chapter with no complications. At least 3 entire chapters were devoted to describing the toilets in the house for lack of any actual plot development. And let's not forget the old guy getting malaria for no apparent reason other than doing the same things he does every day. That was also solved in only two chapters. It was also very predictable because the only mystery was finding out who B was and the lawyer is the only other character so I figured out that it was him almost immediately. There was no suspense, no secrets, nothing of interest in this book. This book is magic. It is more incredible than all the great's I have loved,this is a new favourite, nearly knocking moonfleet from it's first position of best books of all time.I was transported into a magical world of adolescence, not a single other book has ever done that to me. I had the fascination of a child once more.Crafted with wit, skill, sensitivity and intelligence.DO NOT hesitate to buy this book.It is not really an adventure book, it is more a "start again" book of hopeful new beginnings, cathartic at any age. This book was tedious- it tried and failed at drama several times, and made very little sense in parts of it. I hate not finishing books, and I had to really push myself to the limits of my patience to get through this one. I would say don't waste your time with this if you like characters, plot, action, or caring about what you read. The Valley of SecretsWritten by: Charmian HusseyReview by: Grace KuhTrue to it’s title, the novel, ‘The Valley of Secrets’, details the suspenseful journey of Stephen Lansbury whose adventures and misadventures sweep readers into the dark, sometimes dismal, and ultimately thrilling world of secrets. The setting itself reverberates with images of the past. The story starts in London, a place where modern civilization began, before moving to Cornwall, a place unchanged by time. To start off, Stephen Lansbury is an orphan that always keeps things to himself. The writer uses words to describe the protagonist as “teased, withdrawn and rather shy, pretending to be one of the boys, yet sharing few of their ideas and interest,” (pg.15) which are repeated by Stephen’s own teachers who describe him as, “A very old-fashioned kind of boy” and “a loner and probably not very bright” (pg.15) The conflict between character and self begins here. He sits thoughtfully in a “small bed-sitting room in London... looking out onto the discolored brick wall and the dirty chimneys of the city .”(pg.14) The way Stephen sees London shows the internal conflict that the writer uses throughout the novel. For example, Stephen admits that “he had tried hard not to wonder and worry too much about his background...tries to pretend that it didn’t matter, which was easier said than done.” Stephen is always alone and always has to make his own decisions. The writer is telling us that there is something timeless about Stephen, something that is not so remote and unfamiliar. Also, she refers to the “grey-colored sky,” an omen for something, perhaps war. London 1939 was when World War II erupted, with the release of thunderous bombs and jets flying overhead. The plot revolves around two big ideas. The first is loneliness. For example, Stephen talks about being trapped in his life in London. “All his life, Stephen had longed for space. He had dreamed of open space and freedom.” (pg. 16). Also, he seems more fascinated with things and places rather than people: “Stephen has not seen anything like it before....The room glowed green with lush vegetation: enormous leaves with their polished surfaces shining brightly in the sun; giant ferns with their pointing fingers poking boldly out toward him; creepers with long, gray leathery trunks reaching up to the skylight.” (pg. 23) By describing things as seen by the protagonist, the author points out Stephen’s interest in “wildlife and botany.” (pg. 15) The second main idea is mystery. “Exotic things, he thought, whatever they might be, flowers or trees, sculptures or paintings--or even people, often possessed a weirdly threatening quality.... He knew that people could feel threatened by things that they didn’t understand.” (pg. 97) This explains why Stephen felt so eager to find the missing grave of his great-uncle Theodore Lansbury. When Stephen saw his own name on a plaque he suddenly felt “very odd.” For him, it is very disappointing to think about the loss of connections that longed he couldn’t find “in the cold of the stone.” (pg. 91)As a whole, these ideas contribute to the theme which suggests that “even though you are lonely, you will always find help from other people.” Stephen longed to be alone and by himself, but once he arrived at Lansbury Hall, he realized that he had to stay there, because he wanted to know more about his family and he was helped by a bugwomp. Along the way, Stephen meets new creatures and a friend, Murra-yari, who he meets inside a dark and damp cave. “You must be Murra-yari. The Indian smiled. I see you’ve been reading your great-uncle’s journal. I’m very glad to think that you have, for it will help you understand.” (pg. 269) With Murra-yari’s help, Stephen will finally get to unlocked the secrets to the puzzle. Furthermore, the author brilliantly combines language and dialogue to put more focus on the two main themes of the novel. For example, when Stephen meet an old man named Mr. Postlethwaite, he notices that “the old man’s face, previously so sharp and angry, was now transformed by a beaming smile--a somewhat crooked, toothless smile, but a smile of pure delight.” (pg. 30) The difference between “sharp and angry” and “pure delight” is repeated in the conversation between the Mr. Postlethwaite and Stepen about the moonflower. Mr. Postlethwaite describes it as “most beautiful, but also a very sad plant,” but later he says “plants are such sensitive beings. A kind word and even a smile does them a power of good.” (pg.31) This joins the two themes as it suggests how loneliness can only be overcome by friendship.Overall, I will give this book a 7.5 out of 10 because there were some difficult words for me. Also some parts seem to be repetitive, especially the chapters when Stephen was reading his great-uncle Theodore’s diary. The beginning seems to be a bit tedious, but it worked and was there to create suspense. It helps readers anticipate what Stephen is curious about. I specifically recommend this book to advanced readers in 6th grade and up. In conclusion, this author is very inspiring because the author’s style of writing is very unlike than other writers. This book has made me develop my vocabulary because I would had to use my context clue and my prior knowledge to figure it out. Par šādu piedzīvojumu grāmatu noteikti būtu priecājusies savā bērnībā. Bērns manī priecājas arī tagad. Labi, bija tur šādas tādas dīvainības un faktiski sižets bija nekāds, bet to visu kompensēja dabas un piedzīvojumu apraksti. The Valley of Secrets CritiqueBy: Bianca McKeownIn London, Stephen Lansbury gets a mysterious letter that takes him on an unforgettable journey into the unknown. Growing up as an orphan, Stephen never really knew anything about his family, but when he gets a letter asking him to come to an office, he goes there without hesitation. When he arrives in the office, he finds that he has inherited his great uncle Theodore’s will, Lansbury Hall. Upon arriving at Lansbury Hall, strange things start happening to him, and he can’t help wonder, ‘is someone or something watching me?’ First, three of his six bananas go missing and next he finds his great uncle Theodore’s diary where he learns about his great uncle and about Murra-yari, a Indian tribes man. A few days after when he’s on a stroll in the valley, he finds a furry creature which, resembles a caterpillar, and decides to name it Tig. Then one inky night when Tig escapes, Stephen follows him and discovers that he got lead right into a cave full of other creatures like Tig. Then emerging from the shadows, a person, who Stephen immediately recognizes as Murra-yari, speaks “Please come in. You are welcome, Stephen. Far more welcome than these rude creatures would have you believe.” Murra-yari and Stephen instantly become friends and also, Murra-yari starts teaching Stephen everything to know about the bugwomp species. And from here their adventures begin…Moreover, I think that the main themes for The Valley of Secrets are “you never know what the future holds”, and “family doesn't have to be by blood.” For “family doesn't have to be by blood” I think that Stephen, who never really knew anything about being a part of a family, due to him being an orphan, really learned what its like to be a member of a family. For example, two of his extremely close friends, Murra-yari and Tig, are not Stephen’s actual family by blood, but they care for him, respect him, and treat him like a member of their family. An example from the book of family or friendship would be (spoiler alert) “The medicine was finally ready, but Stephen eyed it with suspicion. He couldn’t help feeling very worried. Supposing he had got it wrong? The wrong tree and the wrong bark!” (p.g 344) In that part of the book Murra-yari was immensely sick with Malaria, but he trusted Stephen enough to feed him the tree bark which, if it was the wrong tree, could have killed him. That scene was really putting trust to the test!Additionally, the other elements of fiction (setting, character, conflict) were incorporated sometimes throughout the book, but not often. The element most used in the book would have to be setting because Charmian Hussey was always describing how the setting looked liked making the readers get a very explicit visual of the background. You can picture anything in The Valley of Secrets due to everything being extremely descriptive, like this scene: “The room glowed green with lush vegetation: enormous leaves with their polished surfaces shining brightly in the sun...” (p.g 23) Furthermore, in The Valley of Secrets there is an internal conflict. Stephen often argues with himself in the book about decisions he has to make, like this decision which caused sleepless nights: “But a darkly brooding and worrying shadow seemed to be hovering over Stephen, very often disturbing his nights.” (p.g 303) In addition, Stephen Lansbury, the main character, would be described as “a old fashion kind of boy...” (p.g 14) with a “kind face, nice eyes, and a rare smile...” (p.g 18) For Murra-yari he would be described as “my dear old friend” (from Stephen) (p.g 367) with “bronze skin, and long black hair with a few spangled strands loosely around his shoulders...” (p.g 270)Next, I thought that The Valley of Secrets was interesting in some parts and a little dry in others. Personally, I think that the most thrilling part of the book was when Stephen entered the cave and found out about Murra-yari and the bugwomps. All the suspense that Charmian Hussey was building throughout the whole book suddenly all came together in one nerve-racking chapter. “He could never have imagined the kind of scene that opened up before his eyes as he came to stand in the mouth of the cave.” (p.g 267) But, also there were some chapters, more so in the exposition of the book, which were very slow paced, repetitive, and frankly, a little hard to get through. “Stephen and Tig sat down together for a frugal lunch. Almost all the food had now run out.” (p.g 245)Overall, I thought that the book was a little slow in the beginning, but then picked up in the middle and ended amazingly. Therefore, I would give The Valley of Secrets a 7 out of 10 because there are some words in the book that are challenging to read. Also, sometimes in the book it gets a little tedious, but then after five chapters or so it gets interesting again. In addition, for a grade 6 novel study book I would not recommend it because its a long book (with about 400 p.g.) Also, its harder to answer some questions because the plot doesn't have a protagonist or antagonist. But, I would recommend it for any advanced reader who enjoys a thrilling mystery book! Kind of slow in places, but all in all, a very good read. 3.5 Very interesting with a lot of information. A relaxing read. 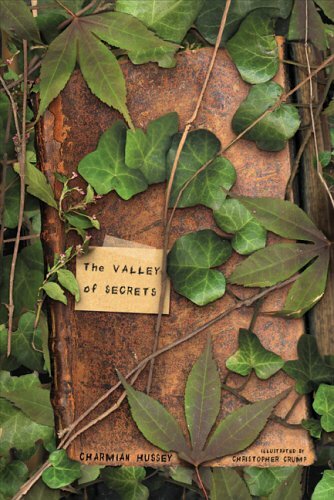 The Valley of Secrets by Charmian Hussey is a secret treasure of fascinating facts about the Amazon set within a novel about a teenage boy who embarks on a mysterious journey to Cornwall, England. Teenager Stephen Lansbury has lived his whole life in an orphanage believing that he had no family to speak of. One day, out of the blue, an odd letter arrives for him. The letter requests that he meet with lawyer, Albert Postlethwaite. To Stephen's amazement, he is informed that he has inherited a grand estate named Lansbury Hall, left to him by his great uncle, Theodore! He is shocked by the gift, but even more disturbing is the fact that he has family that knew about his existence. Stephen is at once thrilled and bewildered, scared and excited. Upon arriving at the estate, he is met with strange plants and animals and Stephen wonders about their origin. As the days wear on, and he becomes acquainted with the grounds and house, mysterious occurrences seem to be happening, not the least of which is a feeling that he is being watched and followed. To alleviate some of these fears, he takes advantage of the massive library and settles into a comfy chair to read. Stephen stumbles upon his great uncle's journals that ultimately reveal the reasons for the lush gardens and the unusual objects scattered throughout the house. In addition, he learns the truth about his family and the demise that fell upon them. But most importantly, he learns about his great uncle's journeys, loves, and family. A family that becomes Stephen's as well. I thoroughly enjoyed this book, not only for the fantastic journey it took me on, but also for the delight in the desciptions and stories of life in the Amazon. Theodore's journals take us back through time, to the early 20th century, when the Amazon was mysterious and glorious, but was in danger of being destroyed by greedy rubber barons who only saw profit in these forests of rich and beautiful wildlife. If you are a lover of animals, you will delight in the antics and intelligence of the playful animals that inhabit the grounds around the Lansbury estate. I found I had a hard time putting this book down, as I, too, 'traveled' with Stephen into Theodore's by-gone Amazon world. According to the quotes on the cover the Sunday Telegraph considers this 'a masterpiece', The Guardian calls it a 'true children's classic; and Time Out sings its praises as 'a paean to the powers of storytelling'... but I'm not convinced. It's description-heavy (450 pages including bibliographies) and story light. In fact – it's not really a story, or at least, not much of one.Orphan discovers he has inherited a strange old country estate in Cornwall from a great uncle he didn't know he had. Goes there, finds it all a bit weird – though necessarily not scary-weird. Eventually pieces together the story of the former inhabitant – a recluse for 60 years – by getting to know his old friend. Cares for said old friend – learning how to look after the estate in the process and when old friend dies, takes over. And the secret? Not much of one really. Old friend was an illegal immigrant 60 years earlier – a child saved when his tribe of Amazonian Indians was wiped out and the dotty great uncle also brought back some new species of critter which have found a secret sanctuary and he wants Orphan to keep them all safe and secret.It's deeply didactic – imparting a lot of morality-lessons about the destruction of Amazon habitats and people. In some places it reads like a botany text book. There are long passages quoted from the journal of Gt. Uncle's Amazonian trip, but if it was meant to involve the reader in two stories at the same time it doesn't really work. I only kept reading because there were long descriptive passages I could safely skim over because they didn't move the story along. (Actually very little moved the story along.) The protagonist – Stephen – doesn't actually interact with anyone except a lawyer, a shopkeeper and a railway stationmaster for the first 300 pages or so and his interactions are limited to the old Amazon Indian for the last 100 pages. I'm not saying it's not reasonably prettily written – but it's long-winded and I found it very uninvolving and I wonder what age of child will be transported by such a book. It may be one of those 'classics' designated by adults, not by its popularity with children. God forbid that it should be foisted on them to read in school. Most of them will be mind-numbingly bored. This book isn't at all what I thought it would be, but, I was pleasantly surprised! In this book, a boy named Stephen Lansbury gets a letter saying that he is to inherit an estate called Lansbury Hall. The thing is, Stephen thought that he was an orphan, that he had no family at all. He soon finds out that he was wrong, that he had family, a great uncle named Theodore Lansbury, but he had recently passed away. As soon as possible Stephen is on his way to Lansbury Hall. When he arrives, he doesn't get the welcoming greeting that he wanted or thought that he would receive. In fact, Lansbury Hall seems to have been abandoned for quite some time. But how can that be? As Stephen explores he finds things that he never even knew existed. Things that will change his life forever. He soon learns to except Lansbury Hall and all of it's mysteries. He finds himself reading his great-uncle's old diarys. From them he learns about countless things. If not for the diarys, Stephen might not have survived. They answer a lot of the questions that Lansbury Hall holds and so much more...This book is definitely worth reading. It doesn't have a lot of talking though and it's kind of written in an older style, but I enjoyed it. It's a very descriptive book, actually that's what most of the book is. Like I said before there's hardly any talking which at first I didn't like but then as I got into the book more I found that it somehow worked for it. The ending to me was surprisingly very satisfying. It ended in a way to where if the author, Charmian Hussey, wanted to, she could write another book about Stephen and Lansbury Hall, it was left open enough ( at least to me ) to do that. But, it also had enough closure to where you're not left wondering what happens. I was surprised that I liked the ending though, because a lot of the times I don't like book endings. This book will have you laughing, crying, wondering, and entranced, I will certainly be recommending this book to my friends. Was ich gut fand1. Was mir schon nach dem ersten Absatz aufgefallen ist: Die Schreibweise! Charmian Hussey beschreibt Detailgenau und wunderschön, die Wortwahl ist großartig und, obwohl “Das Tal der Geheimnisse” Charmian Husseys einziges Buch ist, sehr profimäßig.2. In dem Buch findet Stephen ja das Tagebuch seines Onkels Theodore, und die Ausschnitte daraus helfen einem dabei, die Zusammenhänge zu verstehen. Die Autorin flickt also einen weiteren Text in das Buch ein, das macht es spannend und geheimnisvoll, da in den Tagebucheinträgen nicht alles sehr deutlich ist.3. Man kann sich sehr gut mit Stephen identifizieren- obwohl er sicher anders denkt als ich, konnte ich mich gut in ihn hineinfühlen.4. Die ganze Geschichte mit der Höhepunktaufteilung und dem Drama am Ende- ich selbst war so verzweifelt als Murra-yari starb, dass ich wirklich weinen musste! ;( Es ist sehr real und gefühlvoll erzählt und vor allem sehr lebendig und tiefgängig.5. Die kleinen Illustrationen sind wunderschön und gut zum “wiederreinkommen”, und am Ende ist auch eine Karte mit dem Anwesen in Cornwall und eine Karte zum Amazonasgebiet, sodass man immer schauen kann wo sich Stephen gerade befindet.6. Das Cover war okay: Stephen, wie er mit seinem kleinen Koffer vor dem exotisch zugewucherten und offen Tor zu Lansbury Hall steht. Meiner Meinung nach ein zur Geschichte passendes Cover Was ich nicht so gut fand1. Manchmal zogen sich die Abschnitte doch sehr in die Länge und ich konnte mich oft nicht genau an das erinnern was geschehen ist2. Ich persönlich mag lieber weibliche Hauptpersonen FazitDas Tal der Geheimnisse ist ein wunderschön geschriebenes Buch für Leser, die die Umwelt mögen und zudem noch eine gelungene, geheimnisvolle und realistische Story mögen. Greift zu! Hmm, this book was problematic, since the idea was great but the realization didn't work out. What I loved about this book though were Theo's letters as well as the depictions of the Indians, trees and other peculiarities of the Amazon jungle.The writing in itself bothered me for Hussey starts almost all of the sentences with "Stephen did this and Stephen did that". I wished Hussey would've used more other types of story telling, since tautology is annoying. I get the "save the rainforests etc." thing, but using it too much kind of wears the message out soon. Stephen wants to save the rainforests, but does absolutely nothing. He actually doesn't do basically anything in the book except think and even that is out of place many times. Half of the book is just about him eating or reading - nothing else. The latter part has a little bit more of action and plot. Stephen is an annoying character who whines all the time and is stupid. When Murra-Yari has malaria Stephen doesn't know what to do - I understand why he doesn't want to get a doctor there, but he could have called a doctor at least or got a damn malaria medication (that you can actually get from a pharmacy)! Not only that but Stephen as well as Theo never revealed the tree-based malaria medication that could have saved lots of people throughout the years. Same thing with Theo's studies on the creatures that were never published - Stephen just decided not to let the world know about the creatures, because he wanted to keep them to himself. Way to go selfishness and stupidity.A weak plot with a stupid main character doesn't save anyone, especially not rainsforests. Este livro conta é a história de um jovem órfão que, de um momento para o outro, se torna herdeiro de uma enorme e misteriosa propriedade na Cornualha. Assim que Stephen chega ao local, depressa se apercebe que este não é exactamente aquilo que esperava, e que a casa e o terreno que a rodeia guardam segredos que ele se esforçará para desvendar.É um livro com uma grande componente ambiental. A natureza, tanto na vertente da fauna como da flora, são bastante exploradas, especialmente nos relatos que Stephen lê nos diários do seu tio-avô, quando este se aventurou com um amigo na floresta amazónica. Estes relatos são intercalados com o presente, à medida que Stephen se tenta adaptar à sua nova casa e ao que esta representa.É um livro dirigido a um público mais juvenil, mas que pode agradar a adultos, especialmente por várias partes de suspense bem geridas, que tornam a história emocionante, e pela parte relacionada com a natureza, que decerto agradará a quem gosta da temática. Só foi pena que o interesse da história nem sempre se tenha mantido ao mesmo nível, devido a algumas partes mais monótonas ou repetitivas. Apesar disso, foi um livro que gostei de ler.A tradução é, de um modo geral, boa, mas não posso deixar de referir que a tradução mais correcta para a expressão "Indian Summer", que aparece na parte final do livro, não é a tradução literal "Verão Indiano" mas sim "Verão de S. Martinho", que é geralmente utilizado em Portugal para descrever o fenómeno. This book blends many topics and themes that are my favorites: a mystery involving a grand, old house; the natural world, and a bit of historical fiction; England; and beautiful chapter illustrations created in a style of sketching that has always fascinated me. Stories about orphans always pull me in, because from the start I feel empathy for the protagonist, and this book was no different. Now, the reasons why I only gave it three stars: the editing and the "critters". The book's first two chapters are really not helpful to the telling of the story. They could be skipped completely, and I think the reader would have an easier time. Also, the American publishers shouldn't have made changes to "Americanize" certain words. Stephen wants fish and chips and eats a bag of chips all in the same sentence. There is already a botanical glossary at the end; a British word usage page wouldn't be too hard to include. Then there are these ridiculous creatures the author invents. Perhaps younger readers find them charming, I think using so much information about the Amazon and truly exotic species with these made up things is confusing.